SKALDAK is the Sydney Metro trained 5yo Gelding by POWER OF DESTINY with 1 win over 1460m and 2 placings over 1400m. In addition to his win and placings he has raced at Sydney Provincial level 7 times for 5 top 5 finishes and showed at his only attempt at being ridden back that he possesses a good turn of foot. It was also his only attempt over 1100m finishing a strong 4th at Wyong ahead of quality gallopers such as CARILLON, CLIFTON COUNTY and JAXIM. He also ran 5th to YOUNGSTAR at Hawkesbury before she went on to Group 1 glory. Skaldak has only had 1 start over 1400m this preparation and is ready to go on with. POWER OF DESTINY (AUS) (Bay 2002-Stud 2007). Winner at 2, 2d STC Pago Pago S., Gr.2. Sire of 116 rnrs, 72 wnrs, inc. SW Destiny's Kiss (ATC Winter Cup, L) and of Tilly's Waltz, Renesmee, Spice of Life, Lifeguard, Bonsai, Power Factor - Fighting Boy (H.K. ), Roussos Destiny, Trojan Destiny, Oti Thelis, Fondue, Mark's Legacy, Angel's Destiny, Preen Queen, Austin's Cane, Destiny's Dance, Franz Loves Trees, Carinda Road, Joey's Destiny, etc. Skaldak (g. by Power of Destiny). Winner. See below. Peso Maker (g. by Byblos). Winner at 1000m in Aust. Tilly's Waltz. 2 wins at 1400m, 1550m, ATC Schweppes H., 3d ATC Tab.com.au H.
Rhodian. Winner at 1300m in Aust. Mighty Matilda. Winner. See above. Head to Toe. Winner at 1200m in 2017-18 in Aust. Barrenjoey. Winner at 1600m in Aust. SMOKEY JACK (Royal Yacht). Joint third on The 1977-78 Aust. 2YO Free H. 3 wins-2 at 2-at 1000m, 1200m, AJC Breeders' P., Gr.3, Sunnyside H., Horsley H., 2d STC Golden Slipper S., Gr.1, Breville H., Victoria Barracks H., 3d STC Silver Slipper S., Gr.2, Phar Lap S., L, AJC Kareela Welter H., STC Santa Anita H., Ben Deeley H., Domain H., 4th STC Todman Slipper Trial H., L, Newcastle JC Northern Classic S., L. Sire. Hail and Shine. 10 wins from 1000m to 1600m, STC WW Hill H., Como H., North Illawarra Probus Club S., 2d AJC Grafter Welter H., Adam Lindsay Gordon H., City Tatt's RC George Negus S., AJC Australia Day Welter H., 3d AJC Kingster Welter H. Sire. Matilda's Lad. 7 wins from 1150m to 1800m in Aust. Ramild. 5 wins from 1000m to 1600m in Aust. Matilda's Son. 4 wins from 1300m to 2200m in Aust. STAR COVET (Covetous). 6 wins-1 at 2-from 1200m to 3200m, A$831,920, QTC Brisbane Cup, Gr.1, GCTC Prime Minister's Cup, Gr.2, STC Neville Sellwood S., L, AJC Grafter H., STC Reindeer H., 2d AJC Warwick S., Gr.2, Hobartville S., Gr.2, VRC Hong Kong Jockey Club P., L, Murrumbidgee TC Wagga Gold Cup, L, STC Daily Racing Form Welter H., AJC Campbelltown H., 3d QTC Brisbane Cup, Gr.1, PJ O'Shea S., Gr.2, AJC Illawong H., 4th STC Rosehill Guineas, Gr.1, AJC Royal Sovereign S., Gr.2, NSW Tatt's RC Chelmsford S., Gr.2, AJC Warwick Farm Spring Cup, L, Japan Racing Association P., L, STC Winter Cup, L, WJ McKell Cup, L.
Legerdemain (Covetous). 6 wins from 1400m to 2300m, A$135,555, Coffs Harbour Cup, 3d Clarence River JC Grafton Cup, Gr.3, Wyong Cup, L, STC Haberfield Mitsubishi H.
Hail to Victory. 3 wins at 1000m, 1600m in Aust. FALVELON (Alannon). Champion Sprinter in Australia in 2000-01 & 2001-02. 15 wins-4 at 2-to 1350m, A$1,957,300, HK$8,900,000, BTC Doomben Ten Thousand S., Gr.1-twice, VATC Schillaci S., Gr.2, BTC Carlton Cup, Gr.2-twice, MVRC Schweppes S., Gr.2, Hong Kong Sprint, Gr.2, VRC Chivas Regal S., Gr.3, Hong Kong Sprint, Gr.3, QTC JF Meynink S., L, VATC Robert Hunter H., BTC Freshman 2YO H., GCTC Kindergarten 2YO Quality H., QTC Isvestia S.H., 2d VRC Lightning S., Gr.1, QTC Stradbroke H., Gr.1, VATC Oakleigh P., Gr.1, VRC Emirates Classic S., Gr.2-twice, MRC Schillaci S., Gr.2, BTC Wyndham Estate Cup, Gr.2, 3d VRC Newmarket H., Gr.1, BTC Doomben Ten Thousand S., Gr.1, MVRC Manikato S., Gr.1, Hong Kong Sprint, Gr.1, AJC TJ Smith S., Gr.2, VATC Schillaci S., Gr.2, 4th MVRC Australia S., Gr.1. Sire. Race Record: 15 Starts 1-1-1 A$27,850. Winner at 1450m in 2018-19 in Aust. 24/Mar/2017 1st of 5 --trial--ATC Barrier Trial, 740m. Golden Road was 2nd and Bert Willy 3rd. 30/Jun/2017 2nd of 8 --trial--ATC Barrier Trial, 804m. Explosive Missile was 1st and Chief Kidder 3rd. 06/Nov/2017 5th of 7 --trial--ATC Barrier Trial (Pro-Ride), 740m. Westrock was 1st and Amazing Chocolate 2nd and Scream Park 3rd. 21/Nov/2017 3rd of 9 --trial--ATC Barrier Trial, 803m. Oria was 1st and Sun Valley 2nd. 15/Feb/2018 6th of 6 --trial--ATC Barrier Trial, 799m. Carillon was 1st and Blazeray 2nd and Legendofoz 3rd. 10/Aug/2018 6th of 7 --trial--ATC Barrier Trial, 795m. Doc Cairns was 1st and Rip Masters 2nd and Infinitely Perfect 3rd. 24/Aug/2018 4th of 5 --trial--ATC Barrier Trial, 798m. On the Top was 1st and His Kingdom 2nd and Crystal Billy 3rd. 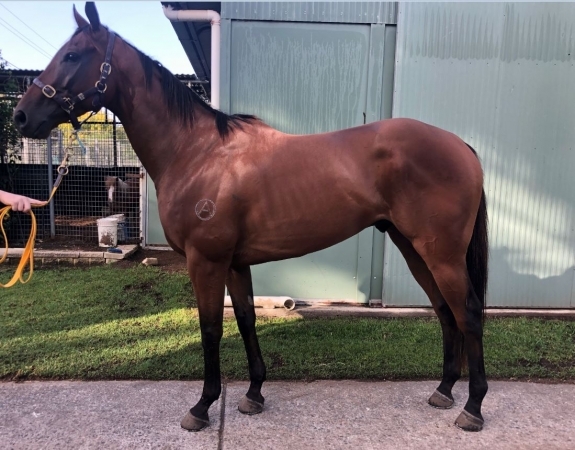 07/Mar/2019 4th of 7 --trial--ATC Barrier Trial, 807m. Invictus Salute was 1st and Maid in Milan 2nd and Citizen's Arrest 3rd. 22/Mar/2019 9th of 9 --trial--ATC Barrier Trial, 801m. Puppet Master was 1st and Ardrossan 2nd and Man From Uncle 3rd. Auction Catalogue Pedigree Analysis: There are ample opportunities to pick up elite quality without the price tag.